Alberta's oil sands are a huge project. But are they a big part of the Canadian economy? And are they too big to have to play by the same rules as everyone else? Oil sands are a small part of our overall economy. Our nation can thrive even if we put the oil sands' CO2 pollution under the same cap as the rest of our economy. In fact, making the oil sands pay to offset their pollution increases elsewhere may be essential to our nation’s economic well-being. Sure the Alberta oil sands are an enormous project. Then again, we are a nation that does lots of big things. Canada is a "can do" nation with a gigantic and varied economy, of which the oil sands are a tiny slice. Proponents of the rapid expansion of the oil sands corporations’ climate pollution highlight the huge scale of the undertaking and the huge amount of money and jobs it brings to our Canadian economy. There is a growing mystique that the oil sands are so big and central to Canada's economy that, like it or not, we just can't afford to cap their pollution and make them pay to offset above their cap. But just how big are they in comparison to everything else? The Canadian Energy Research Institute (CERI) says that the oil sands and oil sands-related activities accounted for 1.5 per cent of Canadian GDP in 2000. They expect this to rise to perhaps three per cent in 2020. This report assumes two per cent of GDP in 2008. 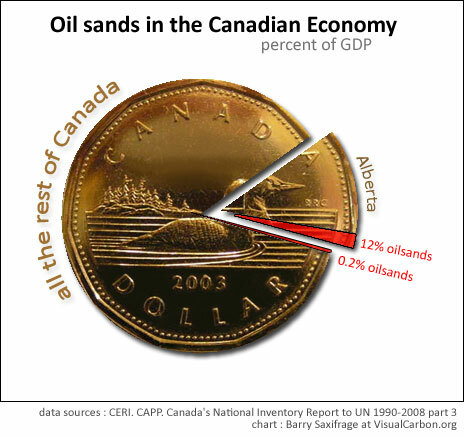 The 10 per cent of oil sand dollars that leak out of Alberta add up to 0.2 per cent of GDP for the rest of Canadians.2 As you can see, this amount is difficult to even find on a pie chart of the Canadian economy. 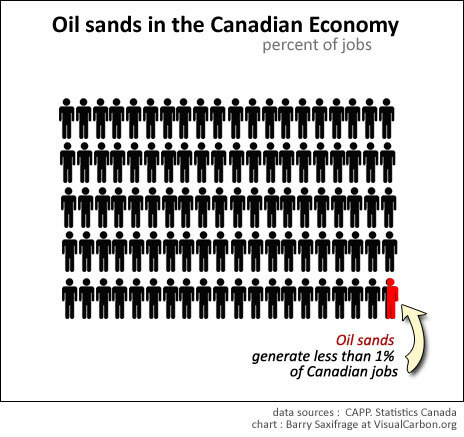 According to industry data, the oil sands generate (“directly, indirectly and induced”) about 0.8 per cent of Canadian jobs. Again, most of these are in Alberta. The fact that the oil sands contribute a small slice of our nation's GDP and jobs is, obviously, not a reason to limit their growth. Canadians welcome jobs and wealth. But they are not "so big" that Canadians can’t afford to require them to live under the same rules – the same declining CO2 cap – that our prime minister has pledged the rest of our economy to live under. Canada can continue to thrive even if the oil sands reduce their climate pollution like everyone else needs to: 17 per cent below 2005. Or else to pay to offset their extra pollution by reducing it elsewhere in our economy. If the oil sands corporations continue to refuse to pay for their CO2 grab from others, then requiring them to operate under the same CO2 pollution caps as the rest of our economy might be essential to our nation’s future prosperity. Canada’s future prosperity requires maximizing jobs and wealth per tonne of CO2. Allowing a small sector of our economy that produces so few jobs and so little wealth per tonne of CO2 to take an oversized slice of our fixed CO2 allotment invites a future of lower prosperity as emissions limits kick in. Why does a small part of our economy get special privileges to force everyone else to cut extra CO2 so they don’t have to? Why shouldn’t this industry have to do their fair share to help the rest of us Canadians cut our CO2 pollution by 17 per cent? 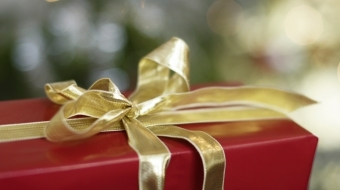 Where is the plan to protect the prosperity of the rest of us from this big grab? 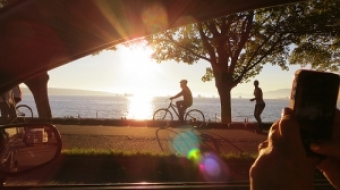 To ensure all Canadians get a fair shot at thriving in the emerging lower-carbon economy, Canada needs and deserves the protection of a comprehensive national climate pollution strategy that explains just who needs to cut CO2, who doesn’t and who will pay for it. As our Big Grab series will point out in our last article, we have several existing made-in-Canada solutions that could be expanded to eliminate this economic threat and national division. It is well past time our federal government implements one of them. Until such a comprehensive national climate pollution plan is in place, Alberta and its oil sands need to pull in their elbows and stop grabbing other Canadians’ fair share. They need to start paying their own way and stop dragging the rest of us Canadians into an economic tar pit. “Falling Behind” sifts through Canadian, American and international economic and greenhouse gas data to reveal the just how far behind we have fallen in the race for low-carbon prosperity, and what the oil sands’ big grab means for our future. note 1: Canada National GHG Inventory Report 1990-2008 part 3 provincial tables shows Alberta GDP at $186b. Oil sands at $24b (two per cent of Canada GDP). Ninety per cent ($21.5b) stays in Alberta, which is 12 per cent of their GDP. note 2: Canada National GHG Inventory Report 1990-2008 shows Canada GDP at $1,322b. Oil sands at $24b (2 per cent of Canada GDP). 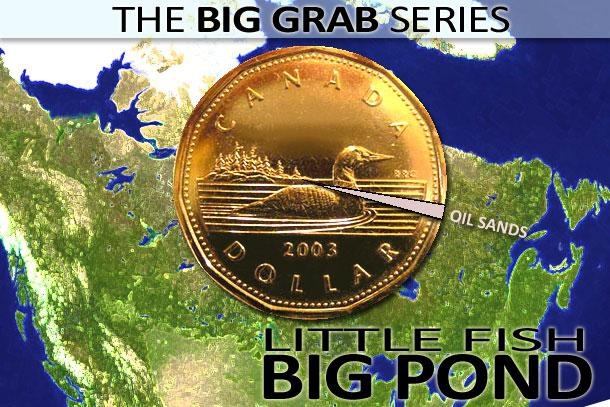 Ten per cent ($2.4b) leaves Alberta, which is 0.2 per cent of Canada's GDP.